Check out Franklin Rose, MD’s patient Diana, a new mother who is ready to go back to work~ and wanted to freshen her look. Diana wasn’t happy with with her chin & cheekbones, and is thrilled with the outcome of her minimally-invasive procedures. 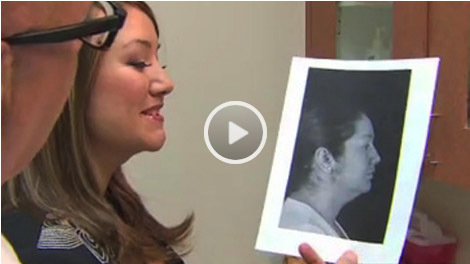 Dr. Rose was able to give her a small chin implant- placed intra-orally (inside the mouth = no scar! ), and a little submental & sub-malar liposuction (under the chin and UNDER the cheekbones!) These procedures took under one hour to perform. 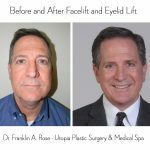 Review the video featuring Dr. Franklin Rose & patient – and check out this dramatic before & after surgery photo! 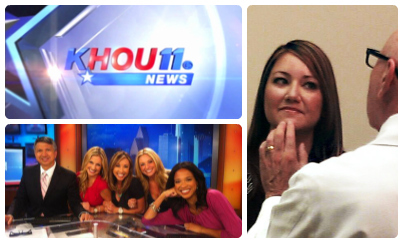 Review the story on KHOU CH 11 featuring Dr. Franklin Rose in it’s entirety – click the image above! HOUSTON — Breast implants are popular in the world of plastic surgery, but a new kind of implant has mostly women, from teens to grandmas, lining up at plastic surgeons’ offices. 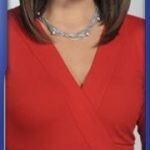 It’s something small, but patients and plastic surgeons alike say it can make all the difference in redefining face shape. Diana wanted one to enhance her profile. But she’s doesn’t want a nose job. Instead, Diana’s going under for something a little more subtle — a chin implant. The American Society of Plastic Surgeons’ report says chin augmentations were the second most-popular type of implant performed in 2012. Diana’s best friend even has one. “Even though it looks pretty small, it’s going to give her just the right amount of profile plasty,” reviews Dr. Franklin Rose. The doctor creates a small incision inside the patient’s mouth, making a pocket for it, before placing it inside and aligning it properly. The entire process from start to finish takes only 30 to 40 minutes. It’s a quick procedure with no visible scarring and lasting results. #TBT – Check out Dr. Franklin Rose’s patient Diana, a new mother who is ready to go back to work~ and wanted to freshen her look. Diana wasn’t happy with with her chin & cheekbones, and is thrilled with the outcome of her minimally-invasive procedures. Dr. Rose was able to give her a small #chinimplant- placed intra-orally (inside the mouth = no scar! ), and a little #submentalliposuction (under the chin and UNDER the cheekbones!) These procedures took under one hour to perform.